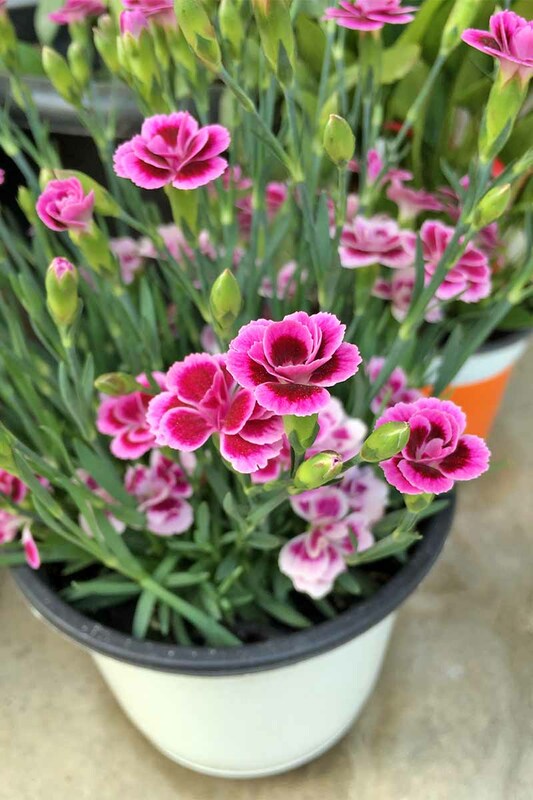 A cottage garden favorite, Dianthus is a genus of flowering plants in the family Caryophyllaceae. Of the 300 species, most are native to Europe and Asia, a few are indigenous to north Africa, and one alpine species is native to the arctic regions of North America. Flowers within this popular genus include carnations (D. caryophyllus), pinks (D. plumarius and other species), and sweet william (D. barbatus). 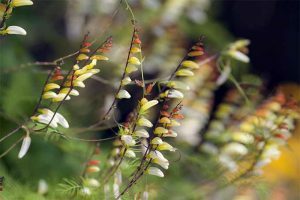 Many are herbaceous perennials, but there are some hardy annuals and biennials available, and even a few that are classified as dwarf shrubs. 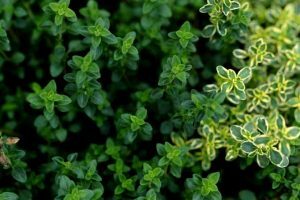 They feature narrow, linear leaves of a blue-green hue that appear opposite one another on narrow stems. 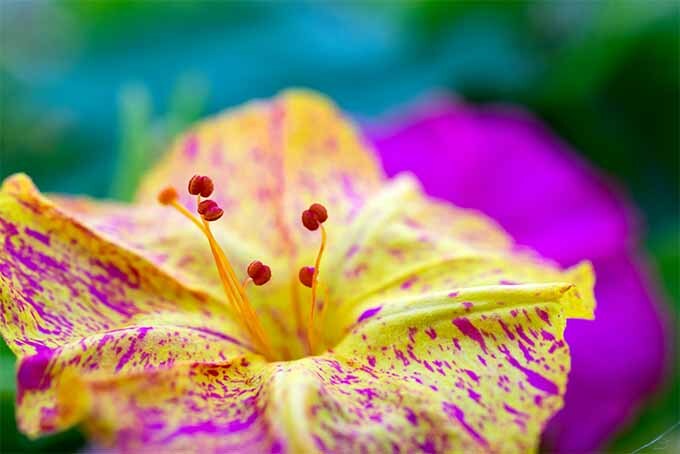 Flowers are typically made up of five petals, often with a frilled or zigzag edge, in hues of white or red tones that range from pale pink through to deep maroon. They are often two-toned. 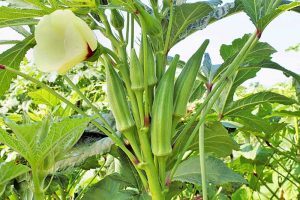 Long-blooming from late spring until early autumn, their attractive mounding growth and pretty flowers are complemented by a heady fragrance of spicy sweetness that is reminiscent of cinnamon and cloves. 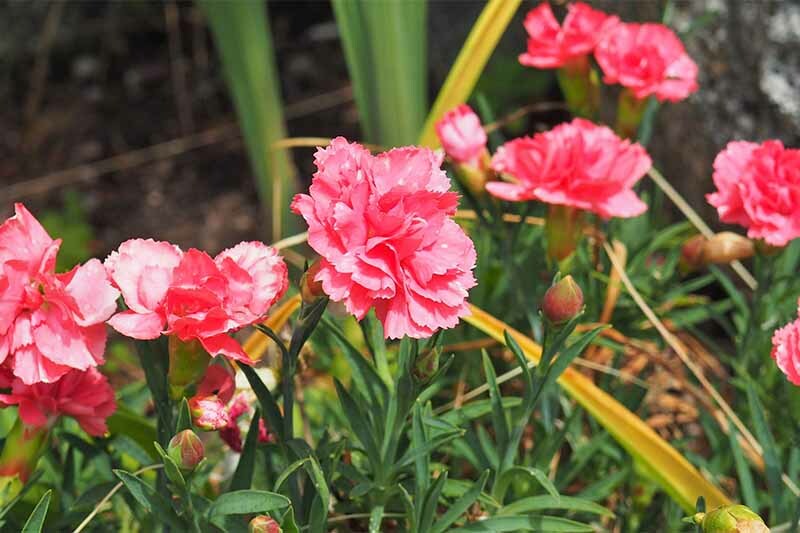 One of the earliest cultivated flowers, Dianthus species have been revered for centuries, and were common in the Greek and Roman eras. They were often featured in ornate friezes adorning buildings of importance, and were added to celebratory garlands. One myth holds that Diana, Greek goddess of the hunt, blamed a flute-playing shepherd for scaring away her prey. In a fit of pique, she plucked out his eyes, and where they fell, red carnations grew – symbolizing innocent blood. 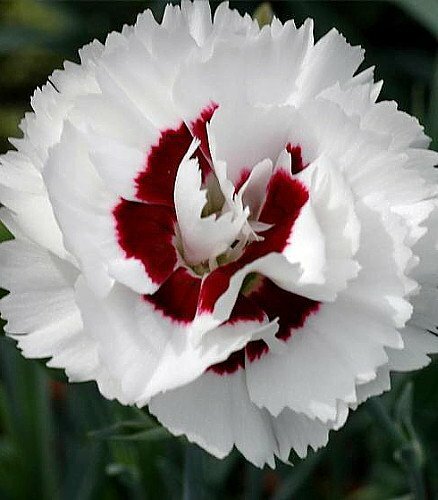 In Christian mythology, it’s believed that carnations first bloomed along the Via Dolorosa where Mary’s tears fell as Jesus carried the cross to Golgotha – another reference to the symbolism of innocent blood. 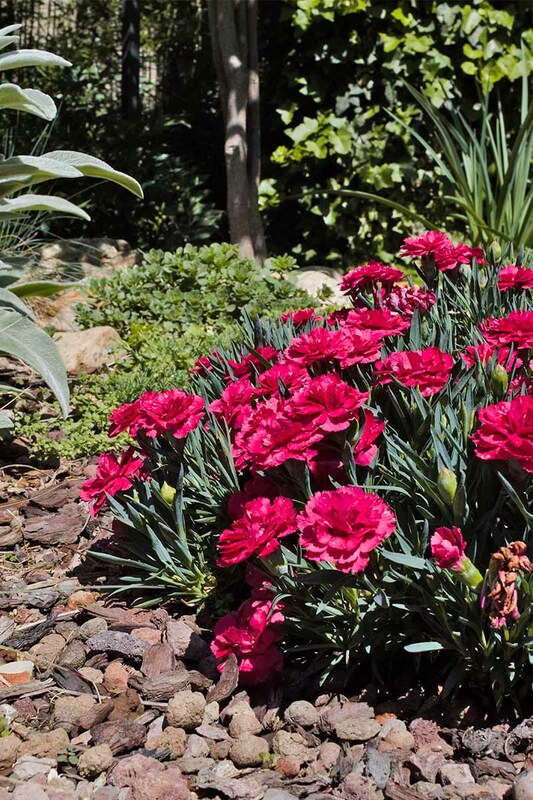 Pinks and carnations have long been a cottage garden favorite, and are highly popular for use in rockeries. And thanks to their outstanding longevity when cut, and their gorgeous fragrance, they also make an outstanding cut flower for floral arrangements – and carnations are still the flower of choice for boutonnieres. Pinks feature a zigzag petal edge. Photo by Lorna Kring. 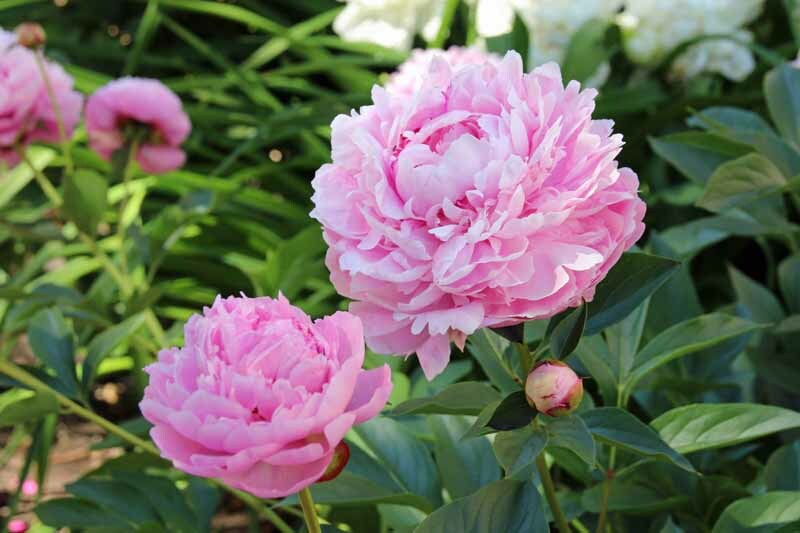 As a side note, the verb “to pink” was popularized in the fifteenth century, and means “to finish an edge with a scalloped, notched, or other ornamental pattern.” As if they were trimmed with pinking shears, D. plumaris exhibits delicately notched petals, in addition to a rosy hue. 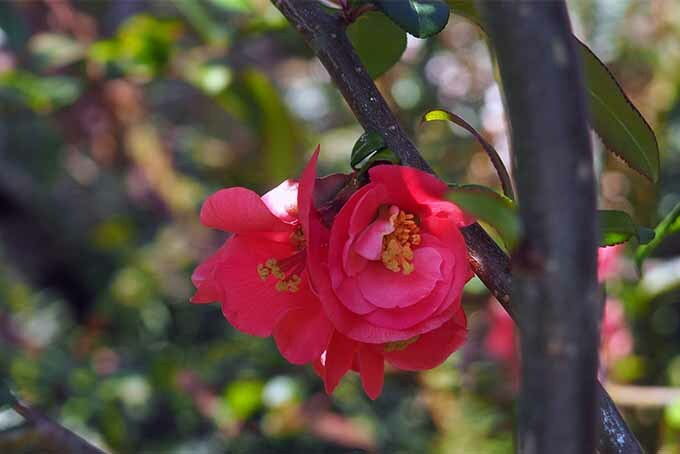 Hardiness varies between the species, ranging from Zones 3-9, but all are easily grown in the home garden. 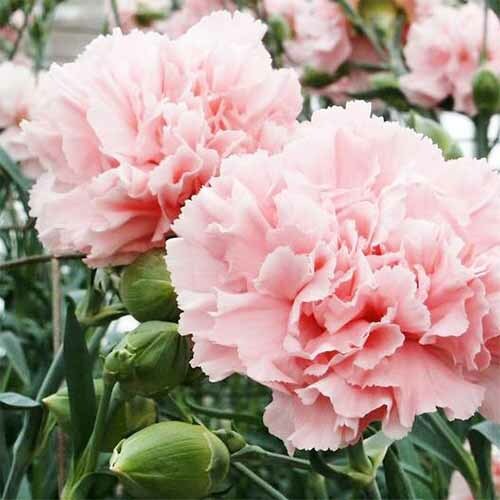 Carnations grow to a height of 24 inches, sweet williams have an upright habit of up to 18 inches, and old-fashioned pinks form mounds that can reach 6-10 inches. 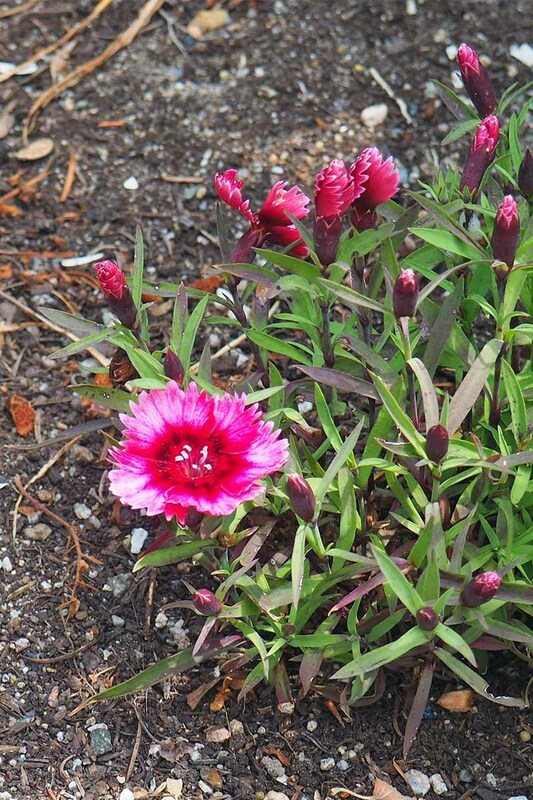 Alpine pinks are the smallest, forming mats only 4-6 inches high. 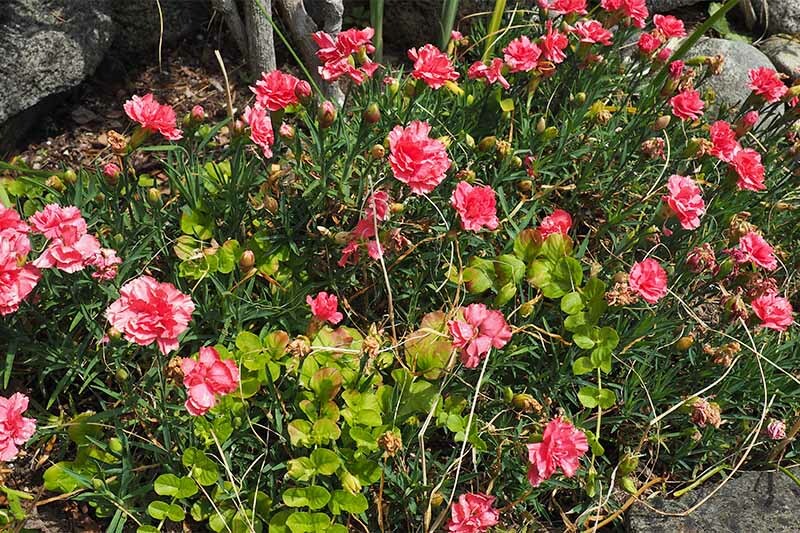 Alpine pink Dianthus is perfect for rock gardens. 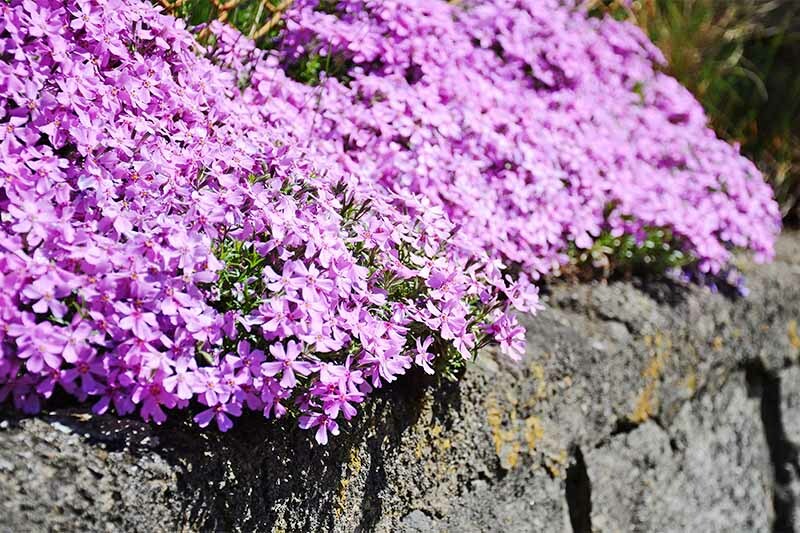 The short, mound-forming pinks make a striking accent at the front of borders, rockeries, and window boxes. 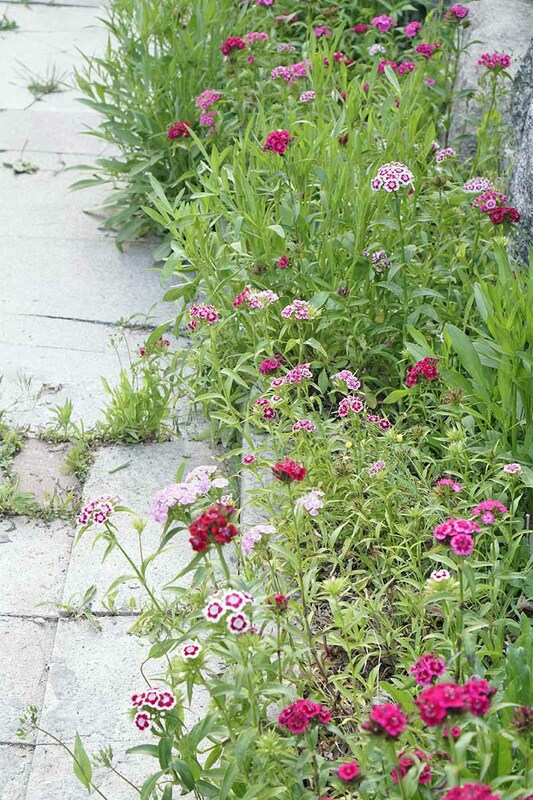 Taller sweet williams and carnations can be placed further back in garden beds for an attractive second layer of color. 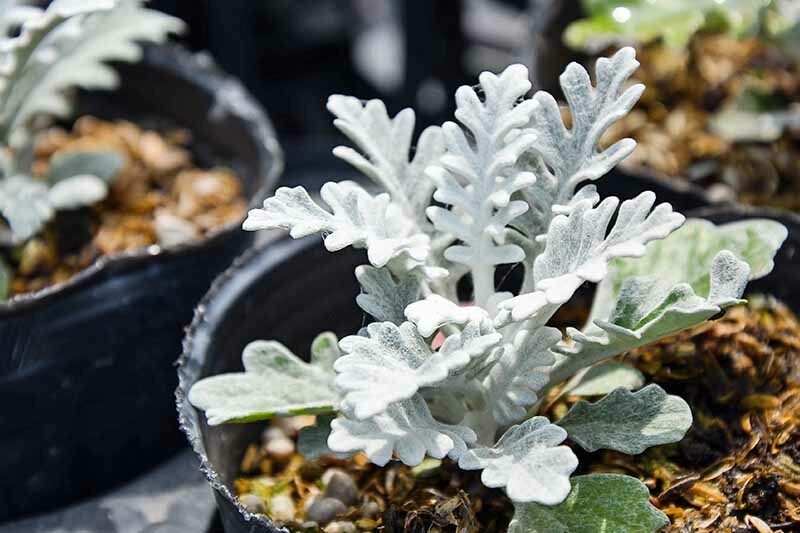 All like a full sun location where they receive at least 6 hours of sunlight each day, and need well-drained soil. Adequate air circulation is also important. 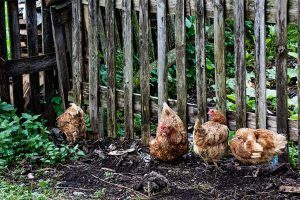 Before planting, provide them with a rich soil that has 2-4 inches of well-rotted compost worked in to a depth of 12 inches, and reapply a top dressing of compost in spring. Mound-forming pinks. Photo by Lorna Kring. Water new plants weekly. 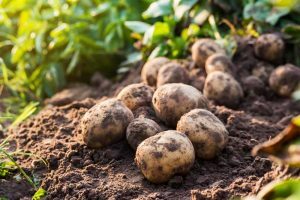 They can be fertilized every 4-6 weeks with an all-purpose liquid fertilizer such as 20-10-20 during the growing season, or apply a slow-release pellet-form fertilizer in the spring. 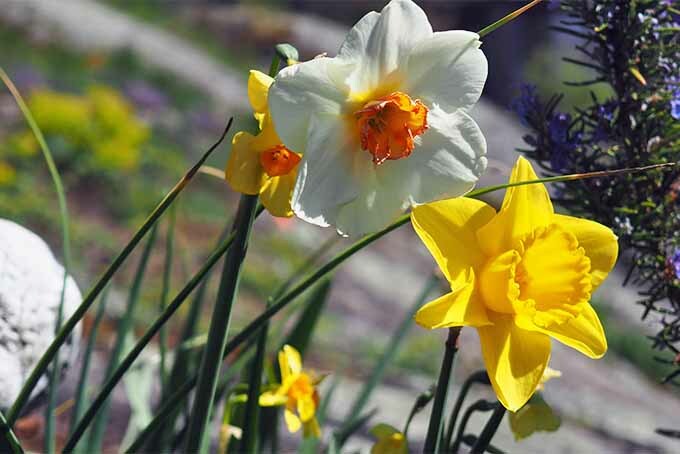 Pinch or snip off dead flowers to prevent seed formation and encourage additional blooming. At the end of the growing season, cut flower stems back to the ground. 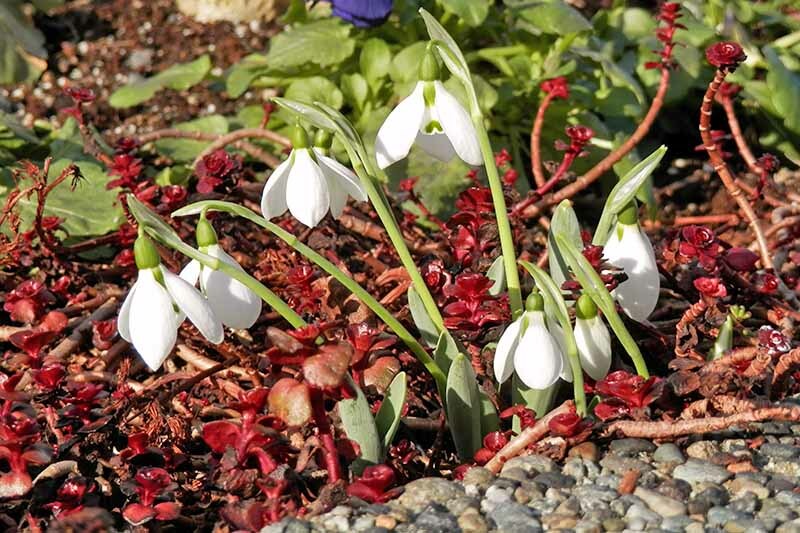 For winter protection, add a 4-inch layer of dry mulch after the first hard frost, and remove in spring once new growth begins. 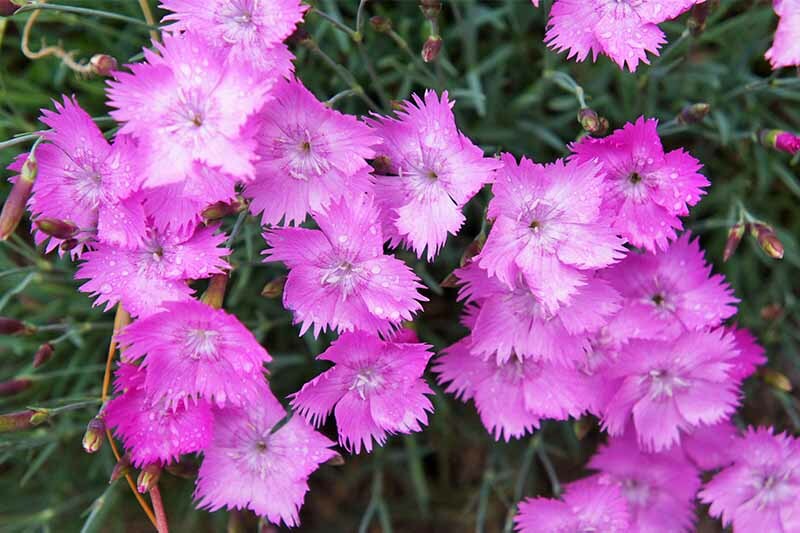 Dianthus can be propagated from seeds started indoors, directly sown into the garden, or grown from stem cuttings. 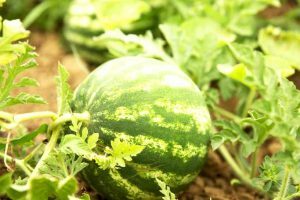 To plant from seed, begin indoors 2-8 weeks prior to the last frost for your area. Plant in a light, loamy soil mix, sprinkling seeds over the top, and then covering with a light layer of soil. D. gratianopolitanus ‘Firewitch’ garden pinks. 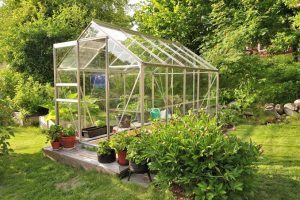 Cover the container with a cloche or plastic bag to keep the soil moist and warm. Once seedlings have 2-3 leaves, move into their own pots. Transplant outdoors once they’re 4-5 inches high. 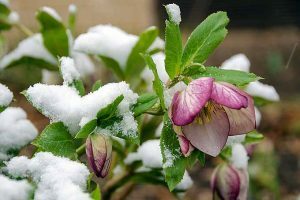 To direct sow outdoors, plant seeds to a depth of 1/8 inch once all danger of frost has passed. 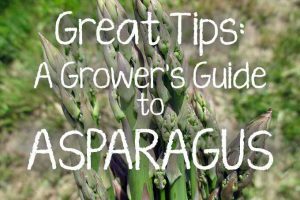 Keep the soil moist, and once they have 2-3 leaves, thin to 8-12 inches apart. To start from stem cuttings, cut away several non-flowering stems from the parent plant just below a leaf joint. Trim away the lower leaves, leaving 4-5 sets of leaves at the top of the stem. 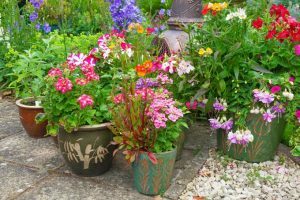 Dip the base into hormone rooting powder, and pot up around the perimeter of a container filled with a light potting soil. Water, then place in a plastic bag, securing the top with a twist tie. Set in a sheltered spot in the garden that receives morning sunlight, but out of hot afternoon sun. Stem cuttings should root in about 4-5 weeks. Remove the soil ball and gently separate the cuttings, then pot up into individual containers. 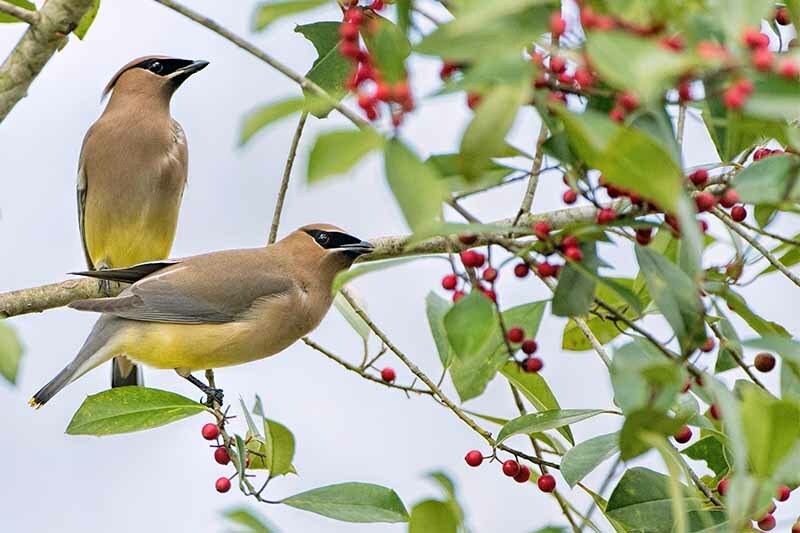 Overwinter in a sheltered spot that is protected them from frost and freezing temperatures. Plant out in spring once the soil warms up. New species are bred for disease resistance, and are mostly problem-free. They don’t like wet feet or damp, humid conditions. Cater to these needs, and they will be well prepared to combat attack. 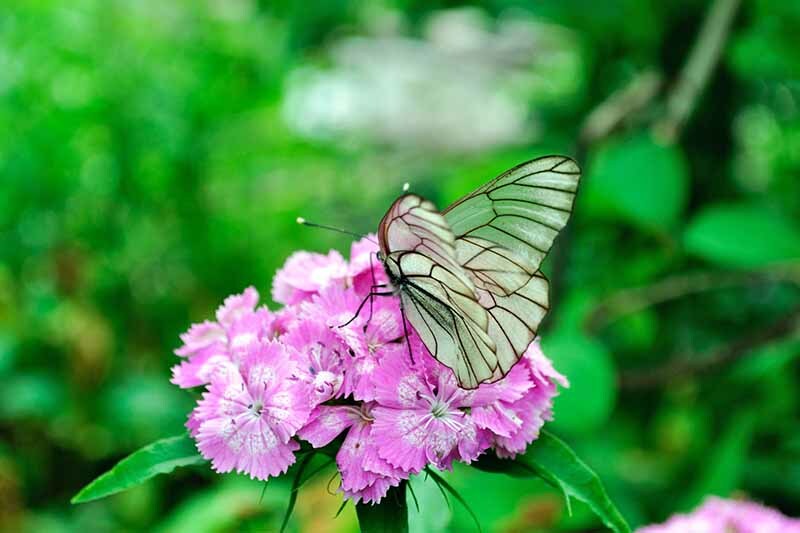 An Aporia crataegi butterfly pollinates a D. barbatus flower. Aphids sometimes feed on the stems and may be easily controlled with a sharp spray of water from a hose, or with ladybugs which serve as a natural predator. 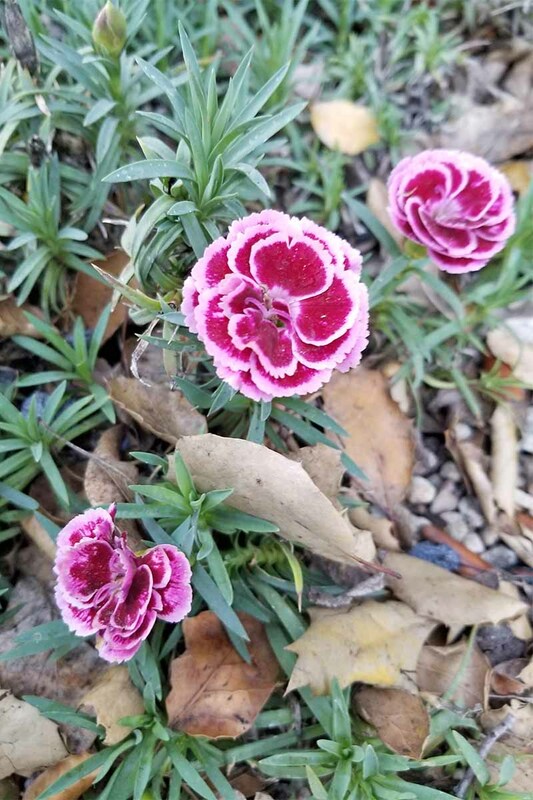 Carnation flies sometimes lay their eggs on the foliage of carnations, burrowing into the leaves and creating pale “tunnels.” Companion planting with garlic or spraying with a garlic tea will eliminate flies and their larvae. Rust can be prevented by providing adequate ventilation. Remove and dispose of any leaves infected with rusty or brownish marks on the leaves, or treat with an application of copper oxychloride. 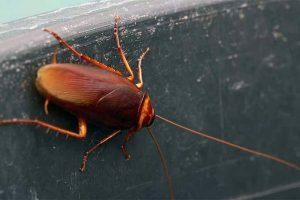 Infected plant matter should be thrown in the garbage, not added to the compost pile. Powdery mildew forms on leaves in warm, humid conditions. Provide proper ventilation and destroy any affected plants, or treat with a benomyl fungicide. 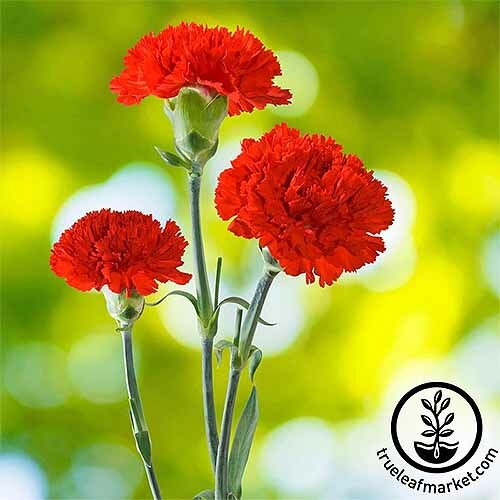 For long-stemmed carnations, ‘Cancan Scarlet’ is a good choice for the garden. 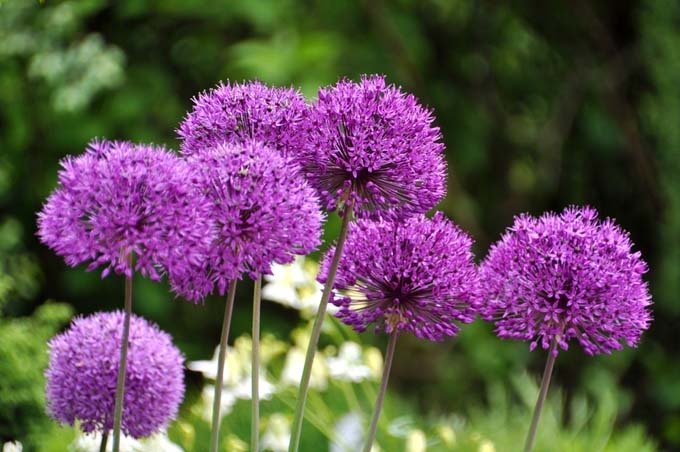 Hardy with a bold fragrance, seeds can be purchased online at True Leaf Market. 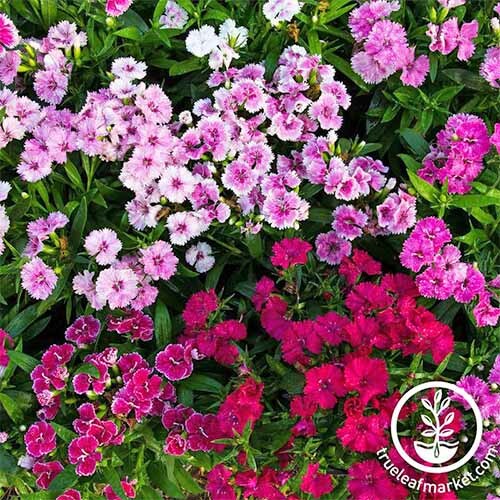 True Leaf also carries a selection hybrid Dianthus seeds, a cross between D. chinensis (China pink) and D. barbatus – try the dwarf ‘Telstar’ mixed series for continuous, colorful blooms all summer. 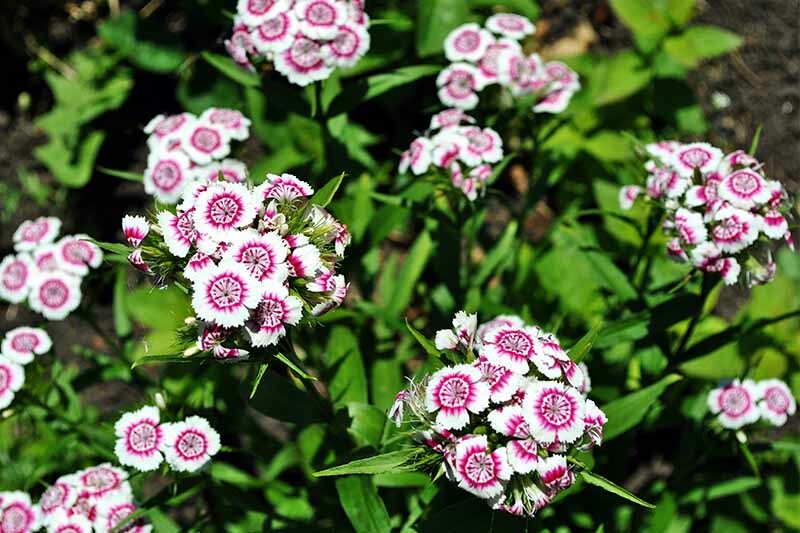 Or, try a 4-inch pot of ‘Coconut Surprise’ – a mid-sized sweet william with white petals and deep burgundy centers, available on Amazon.com from Hirt’s Gardens. 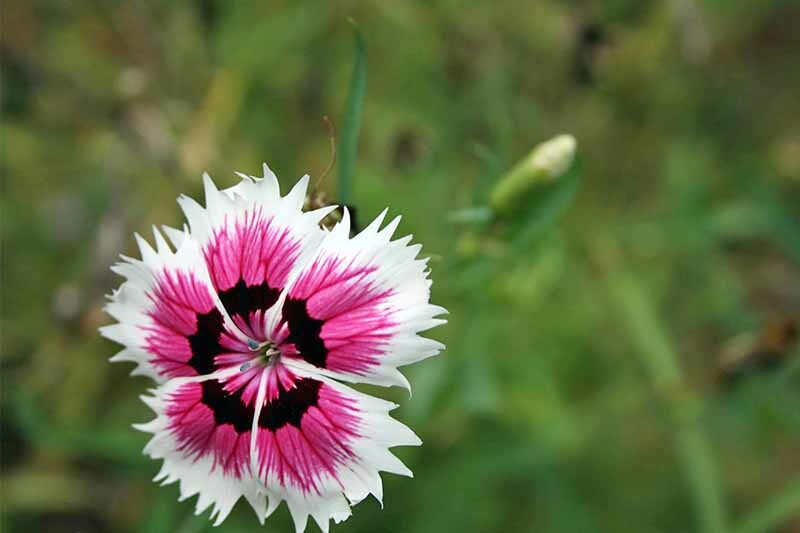 A large variety of Dianthus seeds are also available from Eden Brothers. 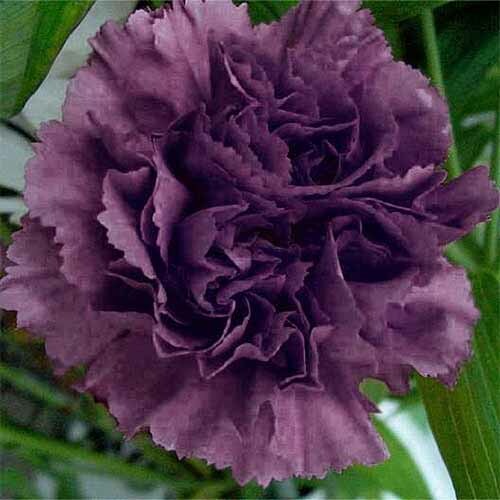 Try ‘La France’ carnations (Dianthus caryophyllus ‘Chabaud’) for a classic pink version, or ‘King of Blacks’ (Dianthus caryophyllus ‘Grenadin’) for an incredible deep purple. 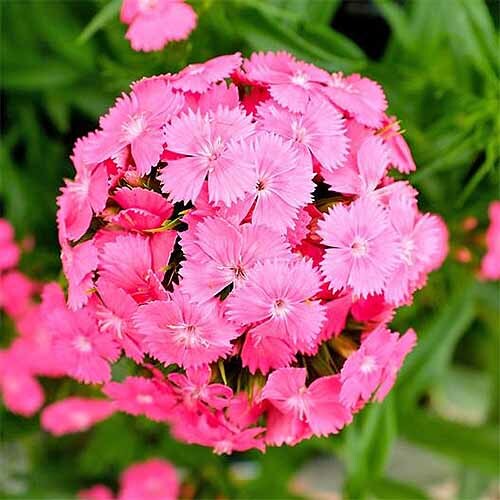 ‘Pink Beauty’ sweet williams are another lovely option, with clusters of vibrant bubblegum-colored and sweet-smelling flowers. 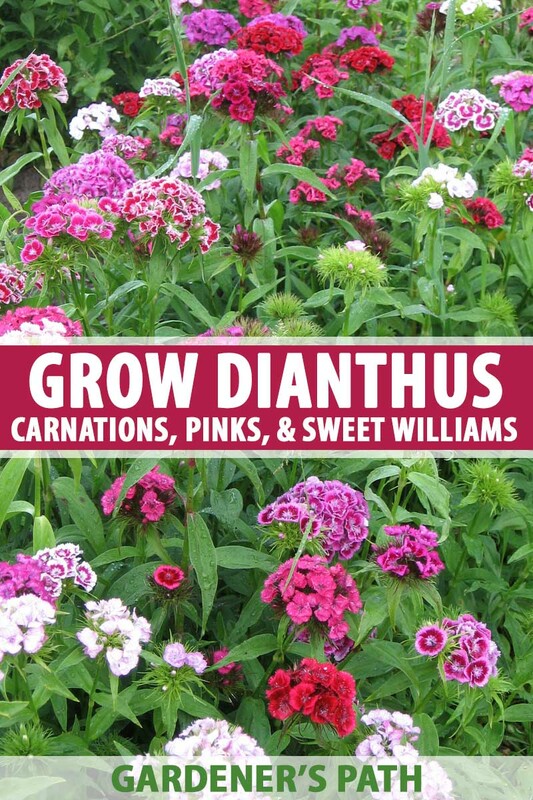 Colorful, fragrant, and easy to grow Dianthus cultivars make a delightful addition to the garden or containers. 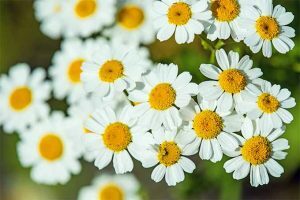 Give them lots of sunlight, good drainage, and plenty of fresh air for blooms and fragrance all summer. 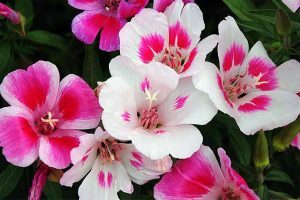 Try a mix of pinks and sweet williams for borders and rockeries, and add in some carnations to bring indoors for floral arrangements. Fragrant and pretty, for continuous blooms all summer long. Photo by Lorna Kring. And be sure to read our article on globe thistle – another excellent cut flower that you’ll have fun growing at home! Photos by Lorna Kring and Allison Sidhu © Ask the Experts, LLC. ALL RIGHTS RESERVED. See our TOS for more details. Product photos via True Leaf Market, Eden Brothers, and Hirt’s Gardens. Uncredited photos: Shutterstock. 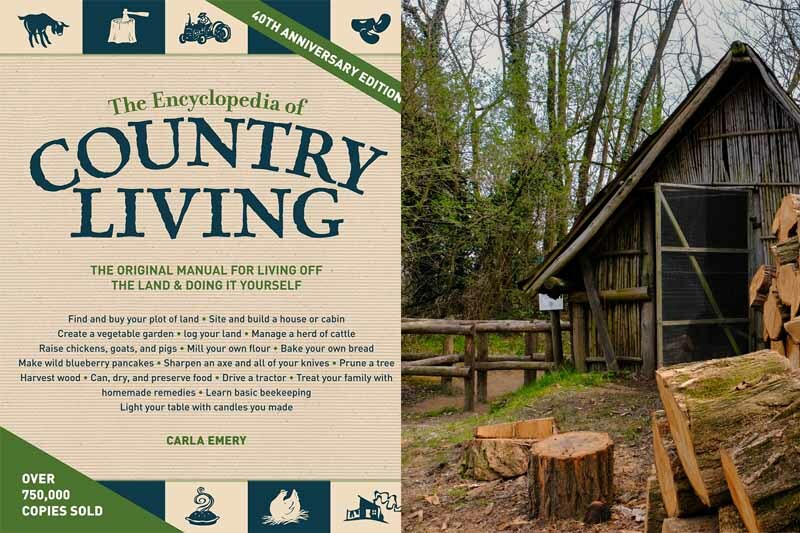 With additional writing and editing by Allison Sidhu.